Trying to be Trendy, again- Oh BROTHer | Food It Yourself! Here’s a guy named Dr. Axe who thinks bone broth is life. Shape Magazine totes thinks you should try it. The folks at Natural Life think its like a totally natural thing to cure your stuff. 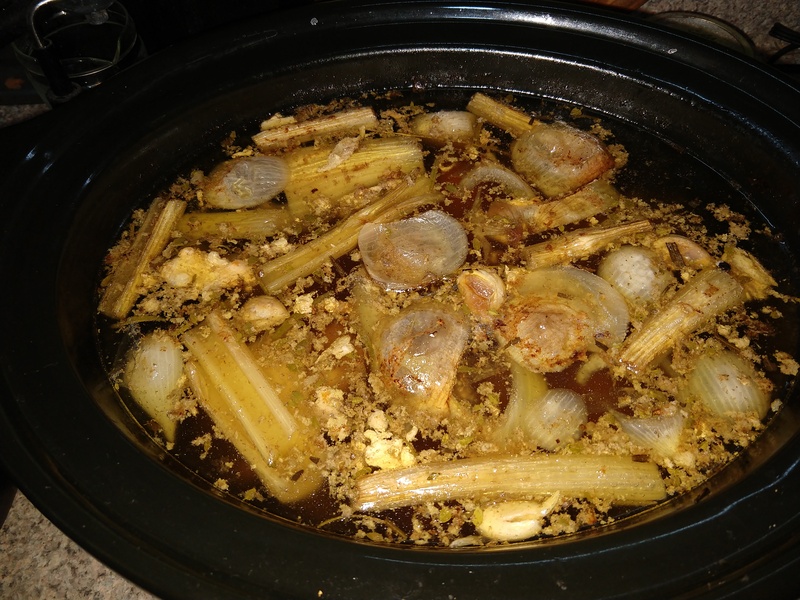 If I keep using my slow cooker for these blog posts I’ll have to give it author credit. Seriously, my slow cooker is my favorite kitchen appliance. So, if these online hucksters are to be believed bone broth will fix cellulite, joint pain, GERD, lower digestive tract issues, the national trade deficit, and ring-around-the-collar. I might be paraphrasing. I could find exactly zero peer-reviewed evidence that drinking bone broth will cure anything. I found exactly one study on line, a 2013 paper by Monro, Leon, and Puri, which cautioned those who “prescribe” a high bone-broth diet to consider the possibility of lead contamination in animal bones. https://www.ncbi.nlm.nih.gov/pubmed/23375414 Worth thinking about, but this is only one study. As always, if you have some scientifically valid information that I do not then pretty, pretty please with sugar on top send me the citation. Nutrition is a fast changing science. It is hard to stay on top of things. So why would I bother? 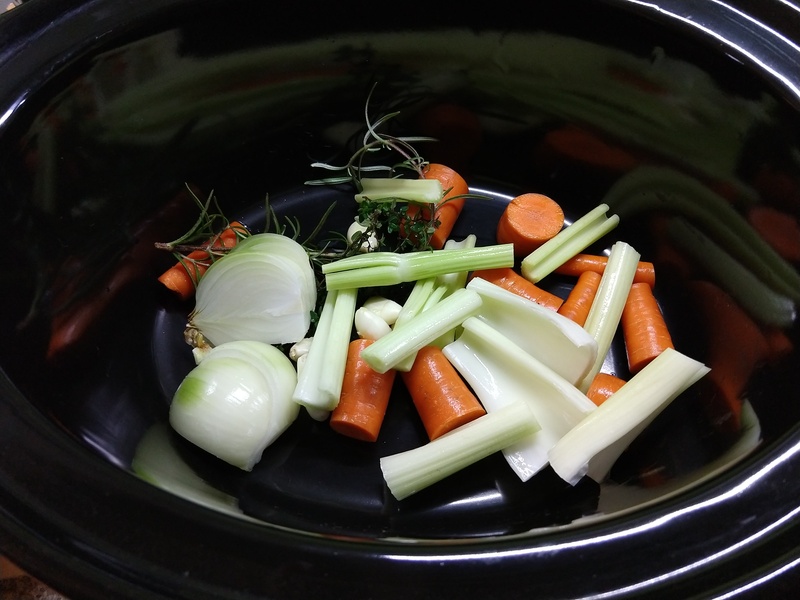 Why should anyone bother with bone broth? I am glad you asked. Bone broth does have good stuff in it- protein, minerals, water- that make it a healthy snack. This is especially true if you DIY your broth with good stuff. Even better, you can make it with really cheap ingredients, including things you might otherwise toss out. Reducing waste while producing a comforting snack? I want in on that, for sure! Any vinegar will work. Don’t get suckered into thinking you need to use something fancy and expensive. chicken I cooked last week. I seasoned it with a teaspoon of salt, a rosemary twig, a few thyme twigs, six all spice berries and about two dozen peppercorns. 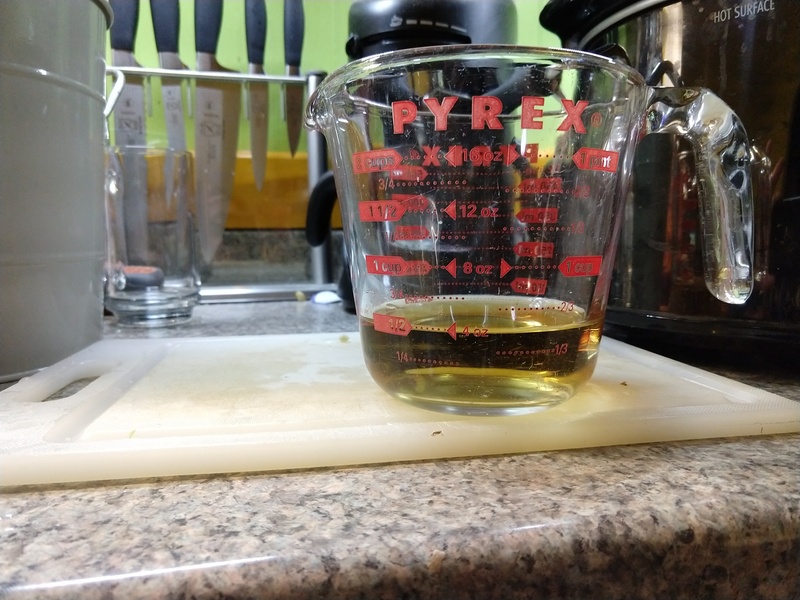 Here is the important ingredient- vinegar. The acetic acid helps break down the proteins in the bones and tendons. I used one half cup. After a good 15 hours on the Low setting everything looked all drab and soggy. That is exactly how it is supposed to look. I strained out all the stuff and let the stock cool in the fridge. There was just a thin layer of fat on the top of the cooled. I skimmed it off. The stock did not set up as jiggly as some of the pictures on the internet suggested it should. 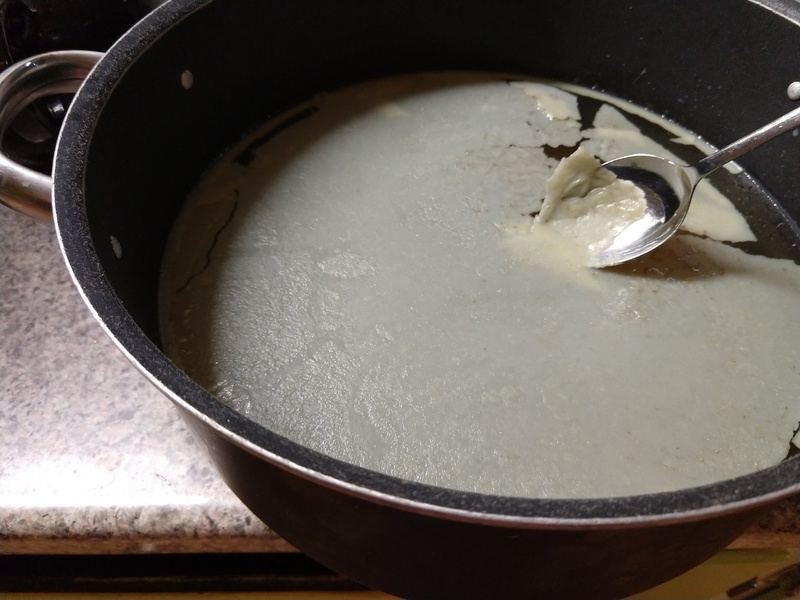 Next time I will use bones with more connective tissues and perhaps cook it a little longer. The flavor is very good, though. I am enjoying a mug full right now. 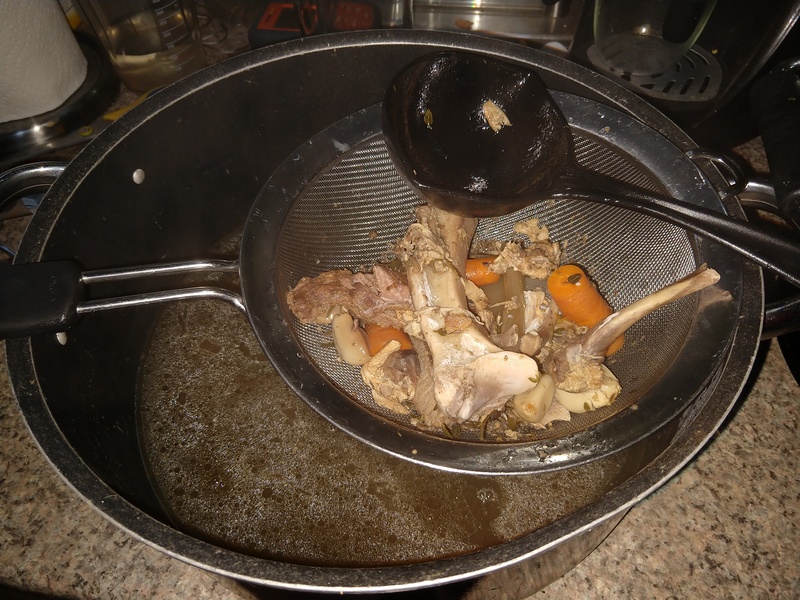 Bone broth may not be a magical cure all- in all likelihood it is not a cure for anything. It is very tasty, inexpensive, and easy to make. By creating and consuming it, you will still have the same dandruff, ingrown toenails and myopia that you had before. You will also have a really good stock for sipping and souping. Give it a try! 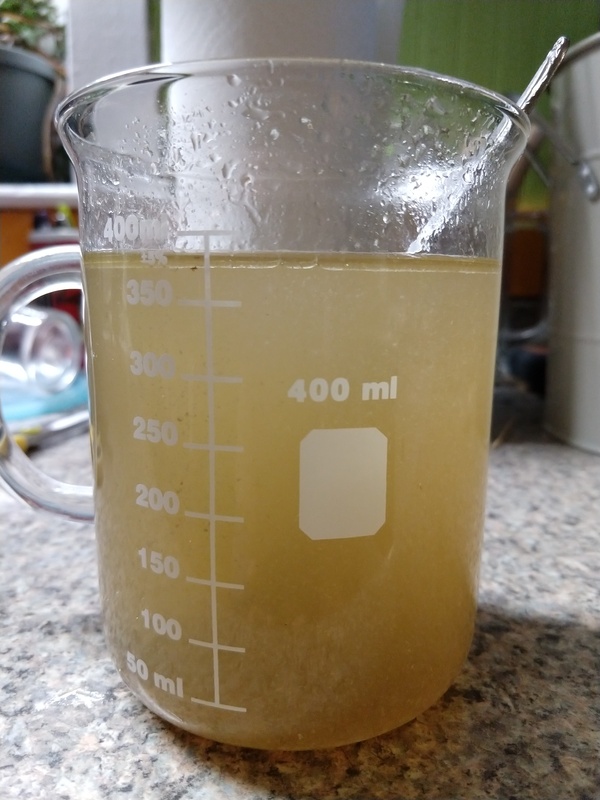 That’s some good slurping broth!